"A new study in the journal Frontiers in Human Neuroscience shows that regular exercisers do better on tests of creativity than their more sedentary peers. Specifically, researchers noted that regular exercise seems to be associated with improved divergent and convergent thinking, which are considered the two components of creative thinking; the former involves thinking of multiple solutions for one problem, while the latter involves thinking of one solution for a problem. 'Exercising on a regular basis may thus act as a cognitive enhancer promoting creativity in inexpensive and healthy ways,' study researcher Lorenza Colzato, a cognitive psychology at Leiden University in the Netherlands, said in a statement." In addition to creativity, exercise promotes proper brain function by preparing and encouraging nerve cells to bind to one another, which is the cellular basis for learning new information. For kids with neuro-behavioral disorders like ADHD and Asperger Syndrome, exercise becomes an essential building block for supporting appropriate development. So what should parents do to make sure kids, particularly those with neuro-behavioral disorders like ADHD and Asperger Syndrome, are getting enough exercise? Setting non-negotiable rules and guidelines to keep kids busy and learning is a great place to start. For example, Dr. Robert Melillo, author of Disconnected Kids and co-founder of Brain Balance Achievement Centers, recommends limiting screen time to 1.5 hours per day during the week. 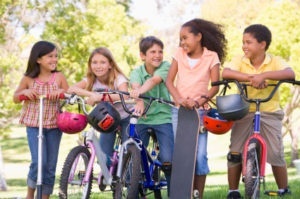 Once homework is complete, kids earn free time that must take place outdoors as weather permits. In today's digital world, kids may be resistant to these guidelines at first, but research from the American Academy of Pediatrics shows unstructured outdoor play is critical for social and cognitive development. Click here for more rules and guidelines for kids that help promote responsibility as well as cognitive and physical development. If your child is exhibiting symptoms of a learning or behavioral disorder, we invite you to consider The Brain Balance Program. Neuroplasticity, the brain's ability to change and improve throughout a person’s lifetime when exposed to consistent, targeted exercise and engaging stimuli, is at the root of our Program. After a comprehensive assessment, our team creates individualized sensory-motor and cognitive activity plans to address your child's symptoms, promote proper neural connections, and improve rhythm and timing. In addition, our nutritional guidelines are supported by recent research that stresses the importance of a healthy diet in decreasing symptoms of the neuro-behavioral disorders. Contact us today to learn more! Why Don't Kids Play Any More?